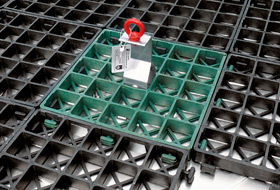 There is no need for roof penetration with the Fallnet® SR system with a fixed single anchor point. ZinCo solutions for securing railings also work on the ballast principle. 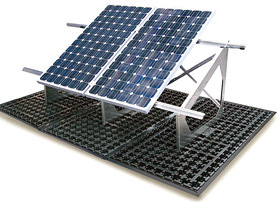 Extensive ballast distribution achieved with the ZinCo Solar Base SB with Solar Base Frame for installing the solar modules. 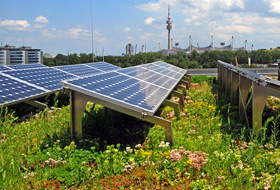 The combination of solar energy system and green roof achieves clear synergy effects. 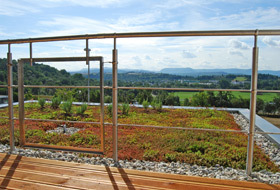 Thanks to the Guard Railing Base GB, the railing can be integrated into the green roof build-up without penetrating the roof membrane. Sustainability is a real buzzword in the construction sector but things are only truly sustainable if they work properly in the long term and this often depends on structural details. 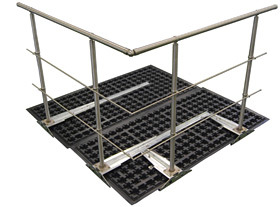 For example, if a fall protection system required by law is planned for a flat roof or a solar energy system or if railings have to be fitted around the sparkling new roof garden, unfortunately, the roof is often penetrated in order to secure these elements. However, in certain circumstances this can create cold or thermal bridges and weak points in the roof waterproof membrane. This is now no longer necessary as ZinCo provides tried and tested solutions that do not require the roof membrane to be penetrated, thereby extending the life of the roof considerably. These solutions all work on the ballast principle. In line with the top priority of "no roof penetration", planners will find at ZinCo the widest variety of solutions for fall protection, railings and solar energy systems. Suitable for new and renovated buildings and for retro-fitting – the intelligent engineering solutions from ZinCo ensure permanent reliability and consequently true sustainability.